← A Little Hope For International Collectors Who Want Jabba's Sail Barge? 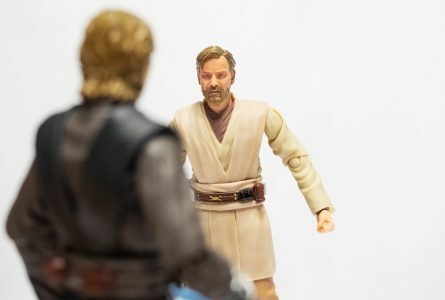 SH Figuarts released their overall 4th (and possibly final) Obi-Wan Kenobi figure in February. It took a little while until my figure finally arrived from Japan, but now that I have the Revenge of the Sith version of Obi-Wan it’s time to take a (very) quick look at it. So click through for my overall thoughts and a few photos! No more pudding for you, young man! Forever! Fans of the prequels have been treated very well by the SH Figuarts Star Wars line. With the latest addition we now have all major versions of Obi-Wan, what began with The Phantom Menace version now ends with the Revenge of the Sith version of Obi-Wan, arguably the most desirable variant from the prequels. And even though Obi-Wan’s look didn’t change that much throughout the prequels the details and colors changed a bit with every movie. Obi-Wan comes with two heads – no face plates this time, SHF decided to provide two full heads instead, so they are seemless. Obi-Wan has five sets of hands, two hands for single wielding the lightsaber, two hands for double wielding the lightsaber, two Force (push) hands, one mind trick / Force use hand and the famous “victory v” hand Obi-Wan used in the duel with Grievous. There is also an extra lightsaber handle without the blade and of course the obligatory lightsaber. In my opinion Obi-Wan is an excellent addition to the collection. Likeness seems to be, to my eyes, pretty great. Is it perfect? Probably not, but remember these are 1/12 scale figures and some details are always lost. However, SHF didn’t forget to give Obi-Wan his mole on the forehead, a very small detail that can only be appreciated when you look very closely. 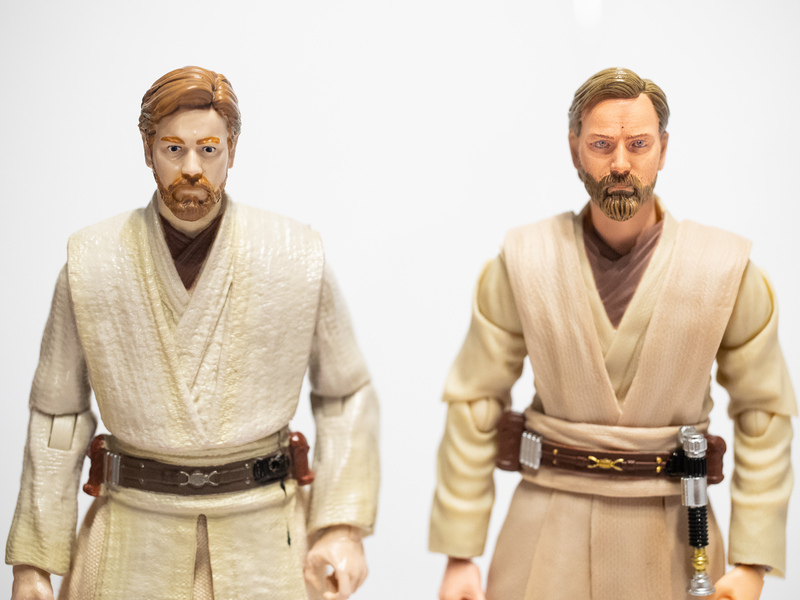 The TPM version probably still has the best likeness ever, the other two versions of Obi-Wan all have a beard and beard is notoriusly difficult to recreate. But overall the likeness is really great, especially in hand, on your desk/shelf. Definitely better than the Attack of the Clones version. This is unmistakbly Obi-Wan as portrayed by Ewan McGregor. 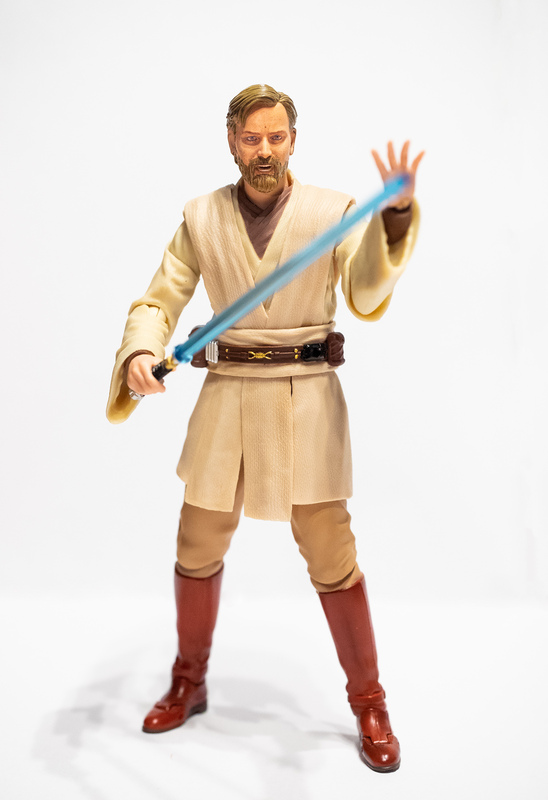 When it comes to accuracy this Obi-Wan figure scores pretty high, but SHF either forgot or opted not to give Obi-Wan his slightly grey temples. So this Obi-Wan appears somewhat younger. When it comes to articulation Obi-Wan has the standard SH Figuarts articulation scheme. Butterfly joints, biceps swivel, single jointed elbows (that give you about 110 degrees of motion), freely rotatable wrist joints, pretty good ab crunch, extendable legs for really great range of motion, single jointed knees that give you all the motion you actually need and finally ankle rocker and toe hinge. SHF figures have very fluid motion, much more fluid than anything you get with the Black Series. Articulation overall is excellent, however, elbow articulation is merely good, not excellent. Obi-Wan can’t stroke his beard, for example, but dynamic lightsaber poses are no problem, using either a single or double handed grip. Scale appears to be pretty good. 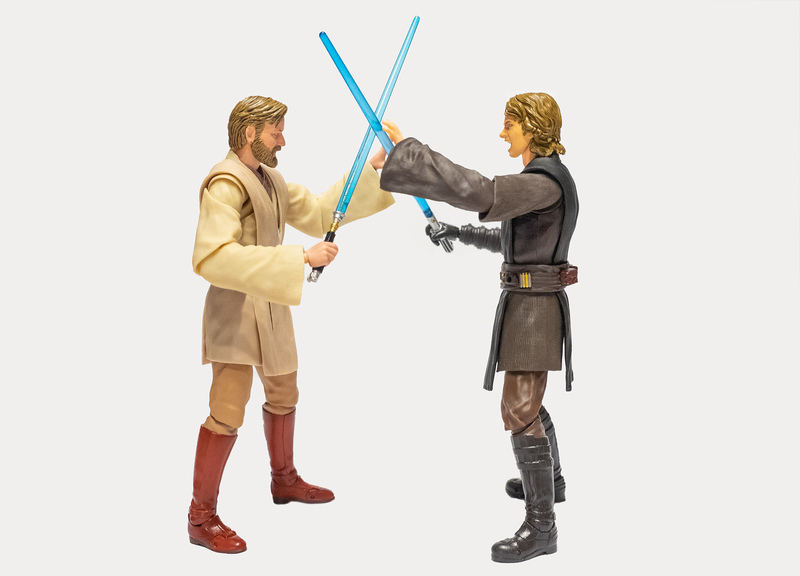 The Episode III version of Anakin is somewhat on the shorter side, however, the figure has drop down legs (as has Obi-Wan) to give him more height (and better range of motion for the legs). Anakin should be taller here. You can achieve this effect by extending Anakin’s legs. Once you drop down Anakin’s legs the height difference is much more accurate. 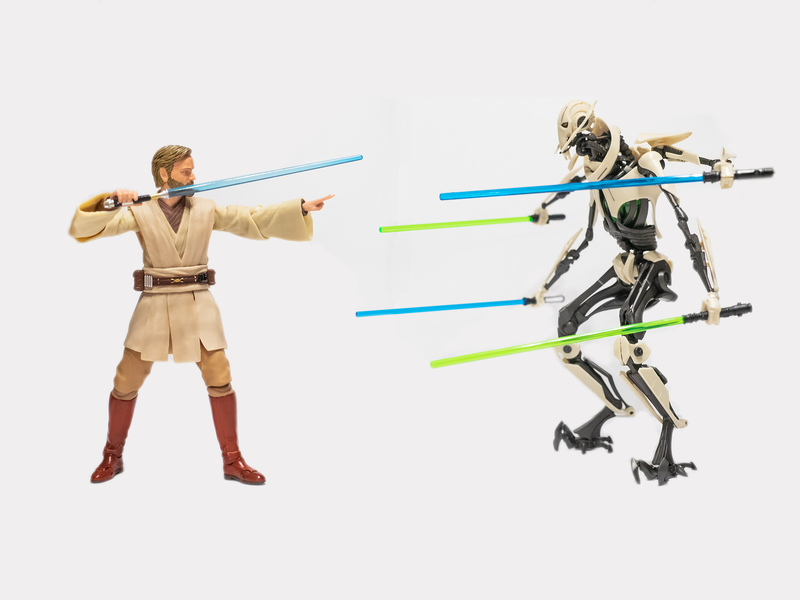 Obi-Wan goes pretty well with the Grievous model kit. I don’t have the Hasbro version of Grievous yet, so instead a photo showing Obi-Wan and the Bandai model kit Grievous. Andf finally a comparison with the quite old and no longer up to date Black Series Obi-Wan, This is not really a fair comparison. Black Series Obi-Wan is probably one of the low points of the entire line. 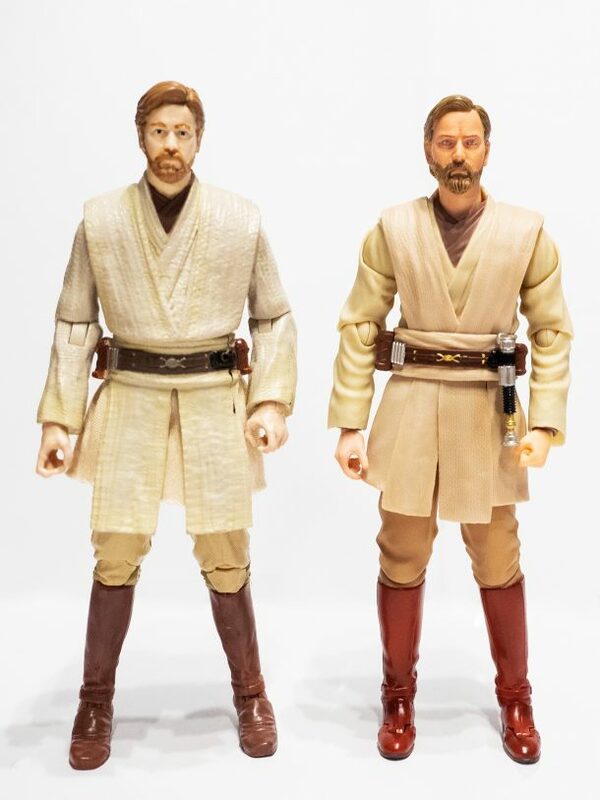 A comparison with the upcoming TCW Obi-Wan will be much more interesting. Well… But when you disregard the paint apps the overall sculpt seems to be pretty similar. It will be interesting to see how SHF would compare with a potential Archive line version. The Revenge of the Sith Obi-Wan is yet another great SH Figuarts prequel figure. SHF collectors now have every major version of Obi-Wan, only a ghost version is missing. The materials used are very high quality, the sculpt is very, very crisp, much crisper than what you get with the Black Series, SHF’s version of photoreal is superb, as usual one caveat is that close-up photos are really not ideal here. These photo real figures are meant to be seen with your own eyes, not through a camera lens. In close-up photos the face looks spotty, blotchy even, but this means that the skin looks very natural when you look at the figure with your own eyes, it’s similar to what Hot Toys does. It adds texture to the skin and gives it a very natural look. 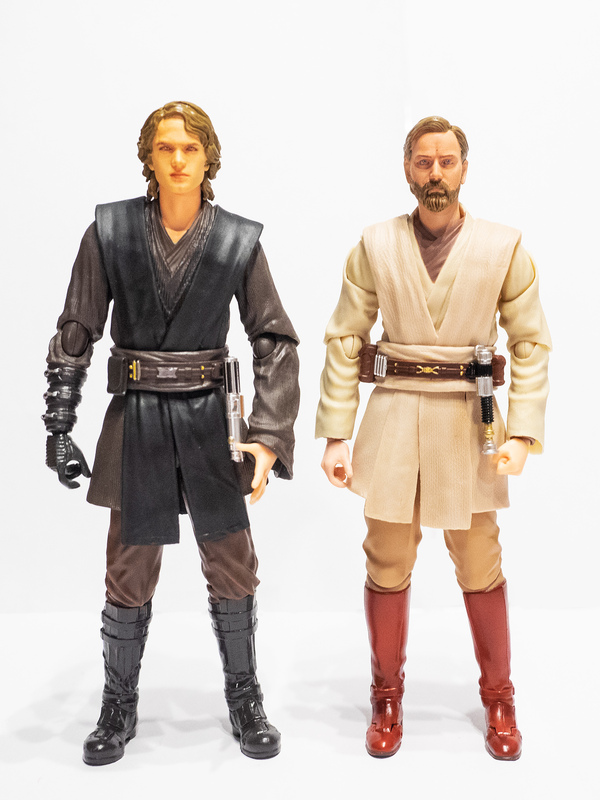 The Hasbro photoreal figures have clean skin, no texture at all, which is why the skin usually looks somewhat more plasticky for Black Series figures. If you have the money you can do no wrong with SH Figuarts Obi-Wan. He comes with almost everything you need. Only a cloak is missing, but no SHF figure has a (cloth) cloak, there are options on ebay, if you feel you must have a cloak. This is without a doubt the very best Revenge of the Sith Obi-Wan you’ll ever find. 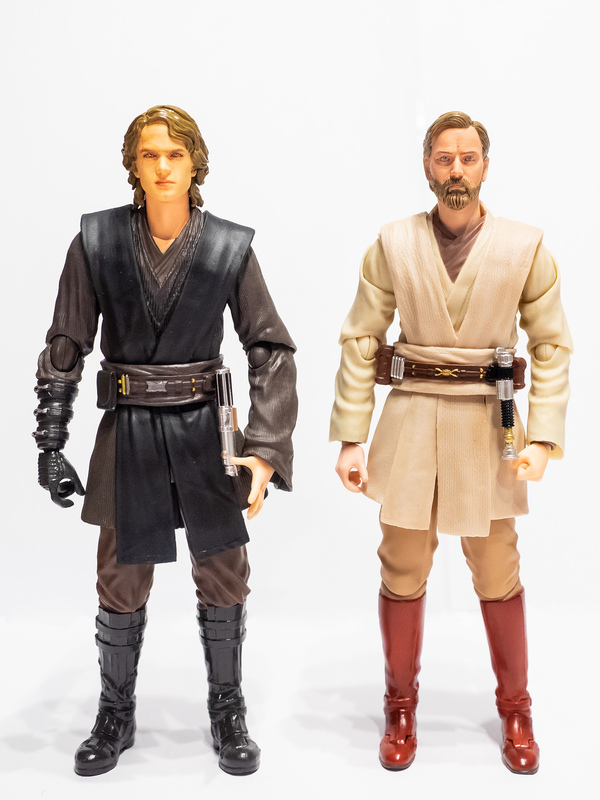 Even an updated Archive line version of the Black Series Obi-Wan would suffer from lack of articulation, soft details and an overall plasticky look. In other words, the Black Series version will always be a toy, whereas the SH Figuarts version is a collectible. It remains to be seen if the upcoming TPM Obi-Wan can score more points for the Black Series. From what we have seen the sculpt seems to be fantastic. Previous Article: A Little Hope For International Collectors Who Want Jabba's Sail Barge?